Intel's profit dropped sharply last quarter due to heavy costs from a restructuring announced in April, though sales were up thanks to the company's powerful data center group. Intel's profit for the quarter, ended July 2, was $1.3 billion, down from $2.7 billion a year earlier, the company announced Wednesday. Revenue climbed 3 percent to $13.5 billion. Intel said in April that it would axe 12,000 jobs worldwide, or 11 percent of its staff, in a plan to cut costs and focus on growing businesses like server processors and chips for the internet of things. In the process, it canceled the development of low-power Atom processors and more or less gave up on the smartphone and tablet markets -- areas where it's never done well. As a result of those changes, Intel said Wednesday it recorded restructuring costs of $1.4 billion, which is what caused its profit last quarter to fall. Results elsewhere were mixed. Revenue from Intel's data center group, which sells Xeon server chips, were up 5 percent from last year, to $4.0 billion. However, revenue from its client computing group, which makes chips for PCs and mobile devices, was down 3 percent to $7.3 billion, Intel said. 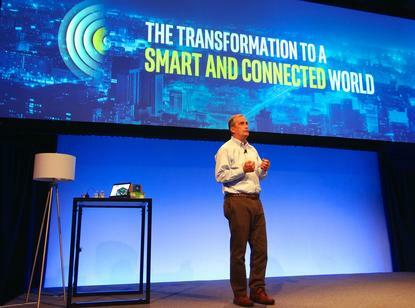 Its IoT group produced sales of $572 million, up 2 percent year over year. On an adjusted basis, factoring out the restructuring costs, Intel's earnings came in at $0.59 a share, better than the $0.53 analysts had been expecting. The revenue figure was roughly on target. “Second-quarter revenue matched our outlook, and profitability was better than we expected," CEO Brian Krzanich said in a statement.